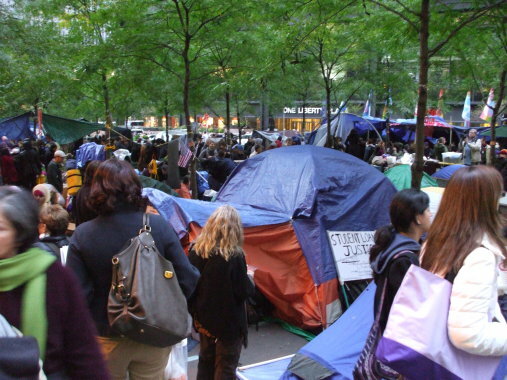 Occupy Wall Street — If They Are The 99%, What Are We? 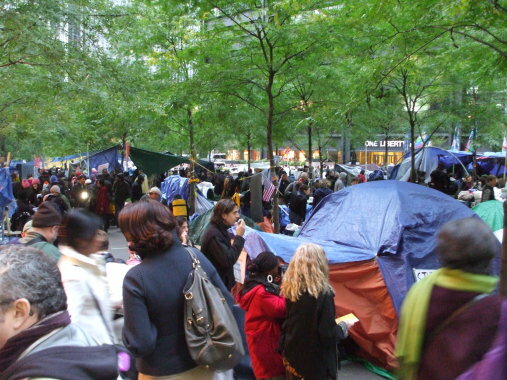 If Occupy Wall Street Really is The 99%, Then What Does That Make Us? 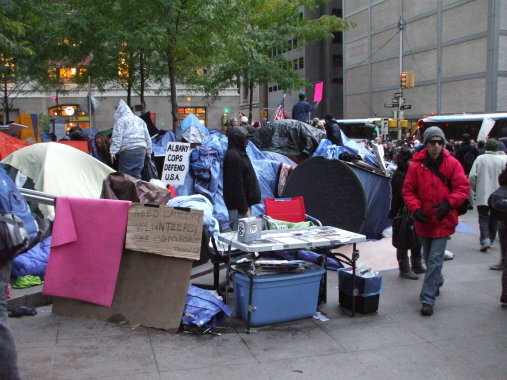 The Occupy Wall Street movement says "We are the 99%!" 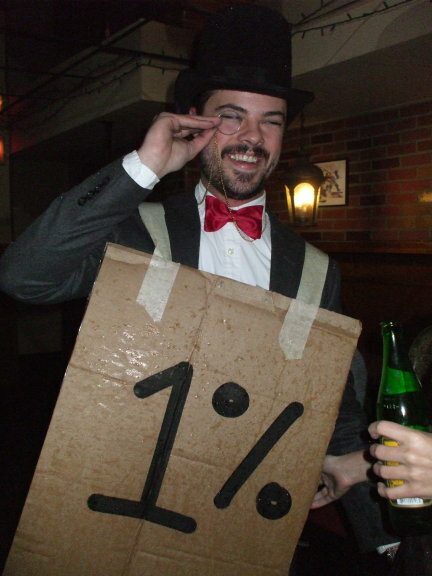 But is it really true that they are the 99%, or is it only fair to say that they are of the 99%? 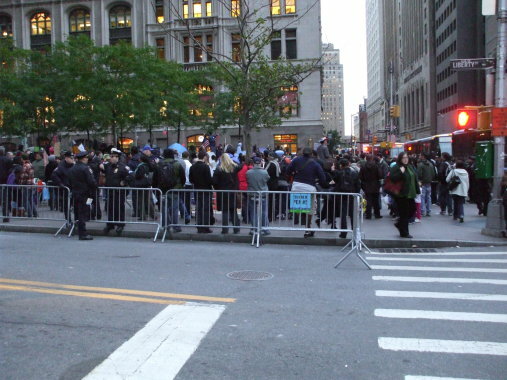 It's hard to tell just what is really going on with them and with groups both allied and opposed to them. 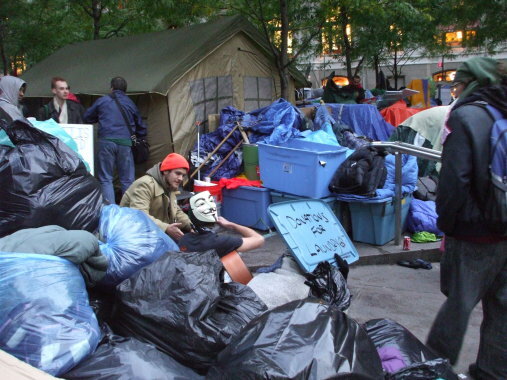 Some say that the Occupy movement is nothing but a bunch of would-be communists. 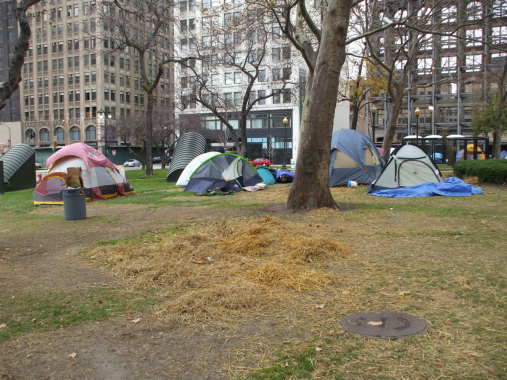 That angers many of the Occupy supporters and probably a few of the communists. 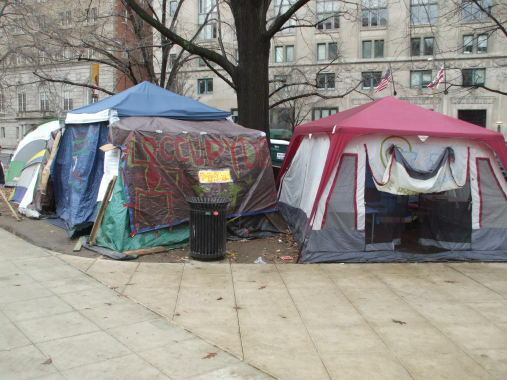 Others say that the Occupy movement and the Tea Party are awfully similar. 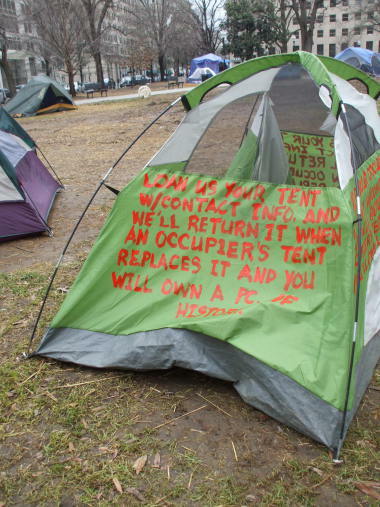 That one gets angry denials from both groups, but... both the Occupy movement and the Tea Party use a lot of classic Communist rhetoric. 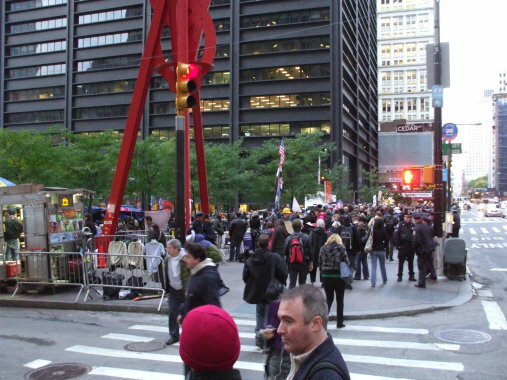 Karl Marx, Sarah Palin, and Vladimir Ilyich Lenin have all written and spoken at length about "Wall Street versus Main Street", complaining that an elitist bourgeoise of Capitalist Barons is suppressing the working class proletariat making up the labor class. 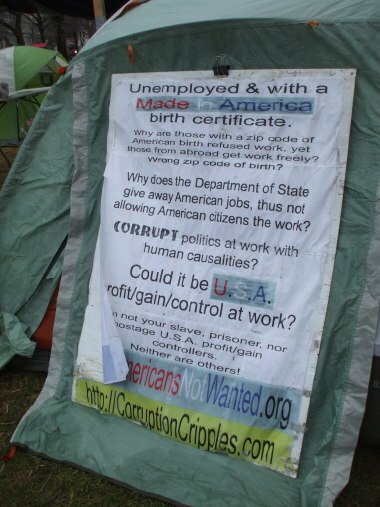 The Tea Party's core philosophy is based on classic Marxist-Leninist thought: An ominous They controlling banking and major corporations are made wealthy by the hard work of a laborer class who receives little to no reward. 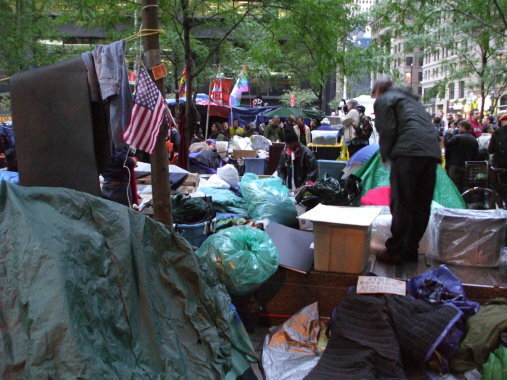 But at the same time, a large contingent of the Occupy Wall Street movement is made up of corporate stooges (to use Marxist-Leninist-Palinist rhetoric). 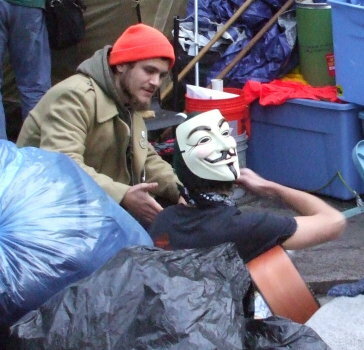 Every purchase of one of these Guy Fawkes masks as featured in the movie V for Vendetta contributes another $6 or so in royalties to the immense Time-Warner corporation. Brother, can you spare six dollars for Time-Warner? Culinary Workers of the World Unite! Maybe the V for Vendetta role players somehow don't realize this, in which case they're just plain old stooges of the non-corporate variety. 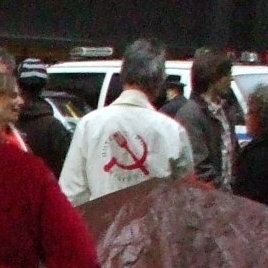 Or maybe agents of the Elite Proletariat have infiltrated the workers' movement. 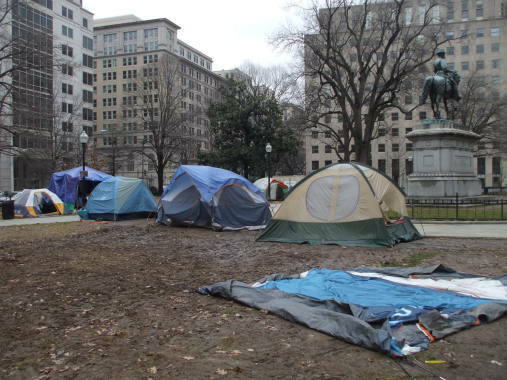 Whether the Occupy Movement is as Marxist as the Tea Party or not, I don't think it really represents 99% of the American population. About 95% White, almost 5% Black, and somewhere under 1% Hispanic. 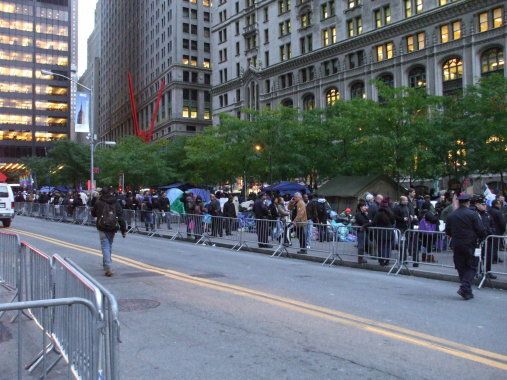 There are no Asians in America, other than a few in the 1% bourgeoise. 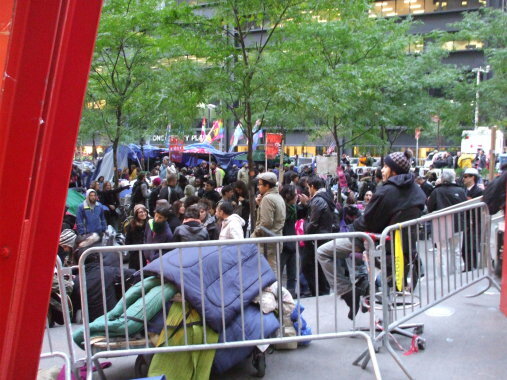 There are no people from the Middle East or South Asia within the 99%. 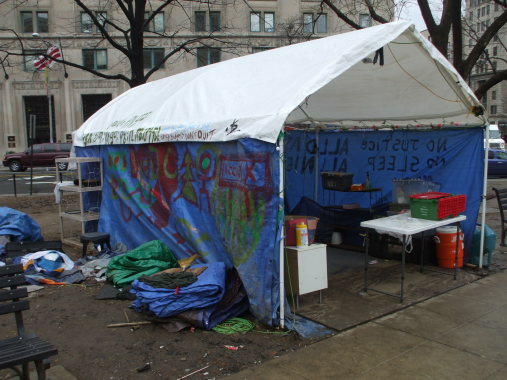 However, they do surround the 99% and sell it most of its food from portable carts. Related to this, most Americans primarily eat food conforming to the halal standards of Islam. About 5% of the population is made up of Dreadlocked Whites. At least 5% of the population is really, really, really into drumming. A small but surprisingly visible fraction of the population owns parrots or other large tropical birds, and these people aren't even pirates! Yaarrrgh! Most people are shocked to discover that student loans on the order of $100,000 are a really bad idea for both the student and the bank. 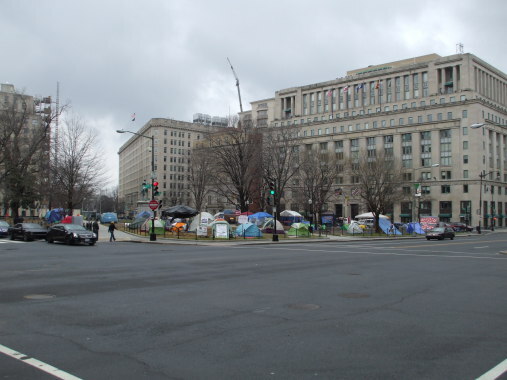 A sizeable fraction of the population believes that major banks and financial corporations are in direct control of U.S. military operations. And by the way, the U.S. seems to be conducting a saturation bombing campaign throughout Afghanistan. Similarly, many Americans believe that banks direct the police to carry out racist policies in many (but not all) cities. 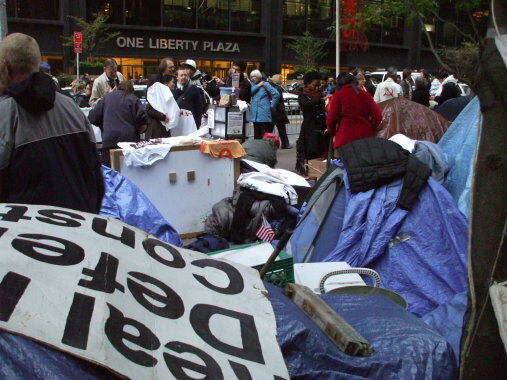 Generally, many Americans believe that The Bankers are in nearly complete control of government policies regarding financial support for military veterans, gay rights, the details of voting procedures, marijuana prohibition, and much more. I had no idea that Bankers applied that much sinister power to such a broad range of interests. We are very tidy about putting our waste material into sturdy plastic bags, but we don't have anywhere to dispose of it. We would like to wash our clothes, but we have to ask others to do that for us. Perhaps related to that last one, we burn a lot of incense! At least 25% of the population burns incense regularly, and maybe over 10% is burning incense at any moment. 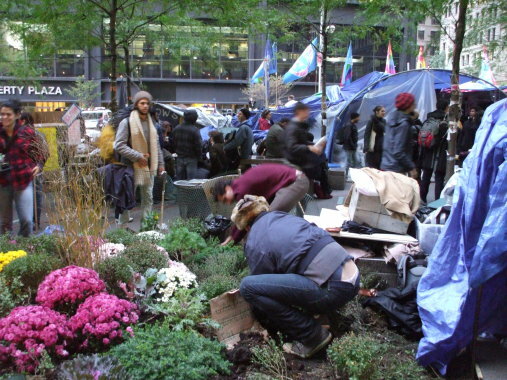 These pictures are of the Occupy Wall Street encampment in October, 2011. 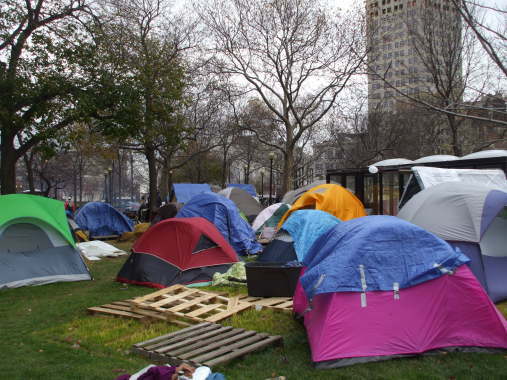 Below are pictures of the Occupy Washington D.C. and the Occupy Detroit encampments. 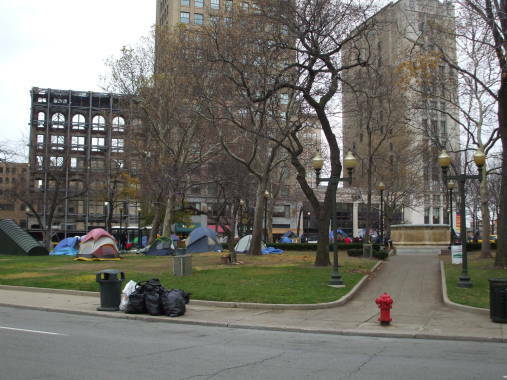 Given how so much of Detroit is a post-apocalypstic ruin, a protest here makes very little sense. 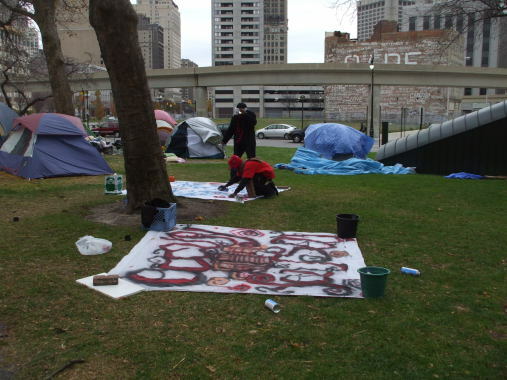 That, of course, did not stop enthusiastic camping and banner-painting and speechifying. 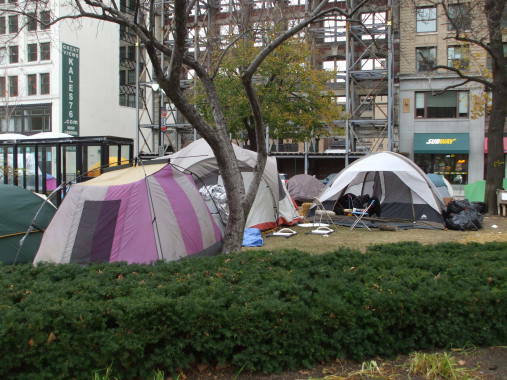 These pictures are from mid-November, 2011. 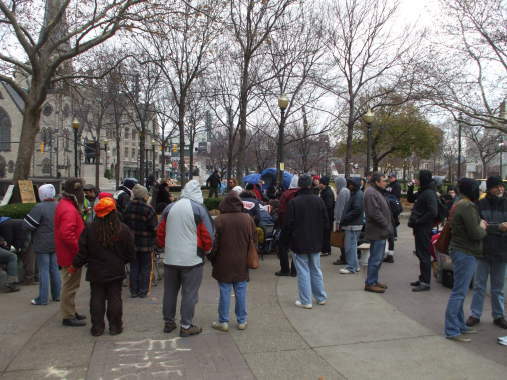 What did seem to stop the Occupy movement were the cool breezes wafting down off Lake Huron as winter deepened. They were all gone by my next visit to Detroit, in the following February. 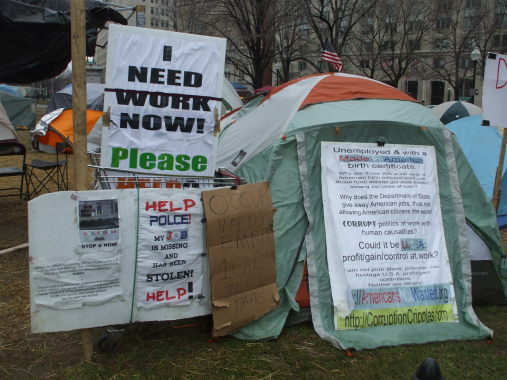 By the time I got to the Washington, D.C. area in late January, 2011, the Occupy protestors were being evicted. 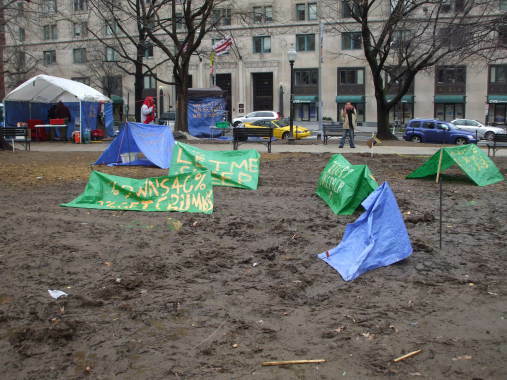 And by the time I got downtown, the permanent encampment was gone. 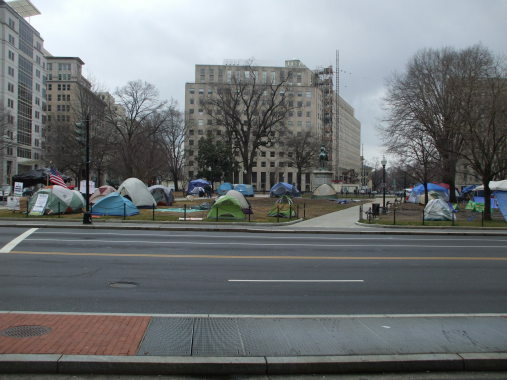 Washington ordnances distinguish between "camping" and a "vigil". 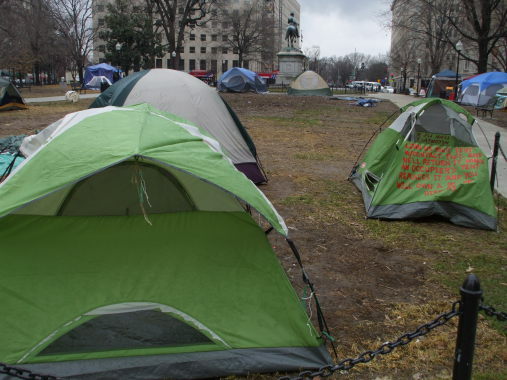 Tents used primarily for sleeping or just personal space are considered to be "camping", while those sheltering awake protestors can be a "vigil". 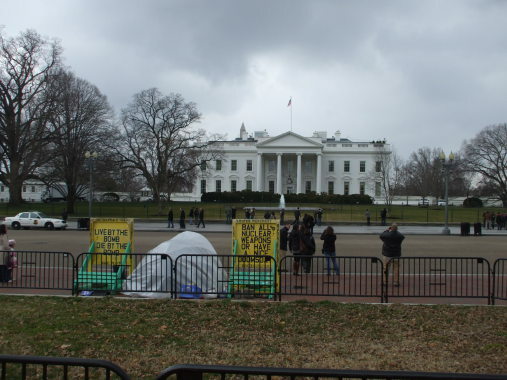 See the permanent anti-nuclear obsessive who has been vigiling away across Pennsylvania Avenue from the White House since at least the early 1980s. 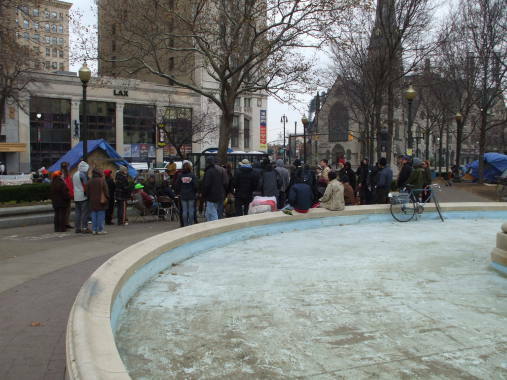 The police had forcibly removed the camping protestors by the time I got downtown. 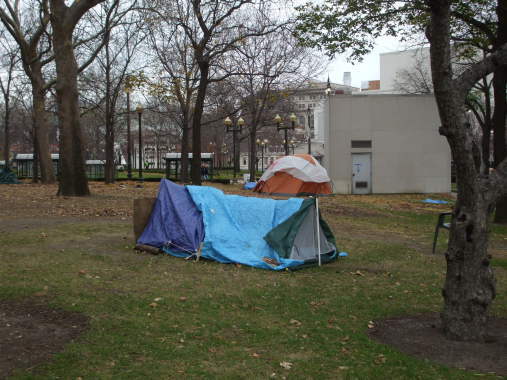 The park had been returned to the control of the homeless and the mentally disturbed.